The Serial Set is a compilation of U.S. Congressional publications published by the U.S. Senate and the U.S. House of Representatives about the bills and resolutions involved in lawmaking. It also includes reports of executive departments, government-funded institutions, and other independent organizations. Documents in the Serial Set are arranged in numeric series chronologically (not topically). 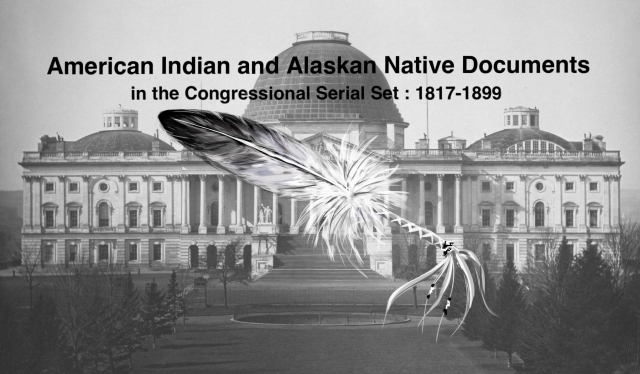 This collection offers detailed contemporaneous documentation of political, military, and governmental activities related to indigenous peoples of the continental United States and Alaskan territory during the 19th century. These government documents were scanned from the print collections of the Oklahoma Department of Libraries and the University of Oklahoma Libraries. They were identified using Steven L. Johnson’s bibliography, Guide to American Indian Documents in the Congressional Serial Set: 1817-1899, published by Clearwater Publishing Company in 1977. Permission for use of descriptive subject annotations was granted by ProQuest LLC as successor in title to ownership of this publication. Individuals responsible for creating the database are Marilyn K. Nicely, Retired Law Librarian for Native American Digitization at the University of Oklahoma Donald E. Pray Law Library; Steve Beleu, retired librarian, Oklahoma Department of Libraries; Jeffrey Wilhite, Documents Librarian at the University of Oklahoma Libraries; Elaine B. Bradshaw, Librarian and Digital Repository Manager, University of Oklahoma Donald E. Pray Law Library; and student workers, Sarah K. Capps and Jared Johnson. Letter from the Secretary of War, to the Chairman of the Committee on Indian Affairs, in relation to the payment of Indian annuities, and the necessity of imposing further restrictions upon Indian traders. Losses -- late war with Creek Indians, Alabama. Memorial of a number of citizens of Mississippi, settlers in the Choctaw Purchase, praying to be allowed the benefit of a preemption law. Message from the President of the United States, to the two Houses of Congress, at the commencement of the third session of the Twenty-fifth Congress. Pay for horses lost in the military service of the United States. Pay guard to emigrating Indians. Petition of a number of citizens of the County of Coahoma, in the Choctaw Purchase, State of Mississippi, praying the passage of a pre-emption law. Pre-emption rights defeated by Indian reservations. Report from the Secretary of the Treasury, on the finances. Report from the Secretary of the Treasury, transmitting a report from the Commissioner of the General Land Office, showing the operations of that department during the year 1837, and part of the year 1838. Report from the Secretary of War, in compliance with a resolution of the Senate of the 14th instant, transmitting the official report of the action of the 25th December, 1837, with the Seminole Indians. Report from the Secretary of War, in compliance with a resolution of the Senate of the 26th January, 1838, in reference to the number of Greek Indians engaged in hostilities against the United States, during the years 1836 and 1837. Report from the Secretary of War, in compliance with a resolution of the Senate of the 29th December, 1837, with statements of the number of troops employed in the war with the Seminole Indians. Representatives of George Duval and others. Resolutions of the General Assembly of Indiana, in relation to the right of pre-emption to the "Miami Reserve" in that state. The heirs of John Motlow. Thomas Johnson -- heirs of. William W. West, assignee of Daniel C. Clark. Document relating to the bill (S. 160) "to provide for the armed occupation and settlement of that part of Florida which is now overrun and infested by marauding bands of hostile Indians." Document relating to the bill "to provide for the armed occupation and settlement of that part of Florida which is now overrun and infested by marauding bands of hostile Indians." Letter from the Secretary of the Treasury, transmitting a statement of the funds of the Chickasaw Indians. Letter from the Secretary of the Treasury, transmitting the estimate of appropriations necessary for the service of the year 1840. Letter from the Secretary of the Treasury, transmitting the information required by a resolution of the House of Representatives of the 28th January, 1839, in relation to payments made at the Treasury for the years 1835 to 1838, inclusive. Memorial of a number of the Chief Warriors and Chiefs of the Six and Seneca Nations of Indians, praying that the action of the Senate on the treaty with the Seneca Indians may be suspended, &c., &c.. Message from the President of the United States, communicating additional information in relation to the disputed boundary line between the State of Missouri and territory of Iowa. Message from the President of the United States, relating to the dispute between the State of Missouri and the Territory of Iowa, respecting the boundary line between the said state and territory.